Consider The Pet Set when you need to board your pet. We offer the finest in facilities for a small number of pets and lots of personal, one-on-one attention. From a day to a month, we can meet the boarding needs of most pets. Our Briarcliff Road facility is indoors in a climate-controlled environment. Each pet has its own place, with enough space to be very comfortable. Please note that Boarding Services are only offered at our Briarcliff Road location. For more details call us at 404-633-8755. We are a boutique kennel for all size non aggressive pets. We offer two types of boarding for dogs at The Pet Set, Standard K9 boarding and K9 Penthouse boarding. In either selection Fresh water is always made available. We feed 100% all natural pet foods as our house brand. Please ask us what we currently are feeding as it changes from time to time. You are welcome to bring your pet's favorite food but understand we charge a small daily feeding fee. Standard Boarding: Our standard boarding is based upon the size and weight of your pet. Pets are housed in kennels which are appropriate to their size. Same-family members can share the same kennel if requested, or can be boarded side-by-side. Pets are given exercise time three times a day in the play yard. Penthouse Suites: Our newest boarding option offers your pet a much larger space with full Daycare privileges for those pets who are social. "The Cat House" Feline Boarding is in a secure area, climate controlled, and away from the dogs. We feature "cat houses" specifically designed for cats with raised perches for cat napping. Fresh water is always made available. We feed 100% all natural pet foods as our house brand. When making your appointment, you will need to have your pet's current shot records faxed to us at 404-636-4903 or bring them in with you at check in. Sorry, pets cannot be admitted for care and can be turned away if they are not current on all shots! Dogs boarding must have proof of current : Rabies, Bordetella, and Distemper/Parvo Virus. K9 Flu H3N8 vaccination is highly recommended. Cats boarding must have proof of current : FVRCP, Rabies, and FelineLeuk. We require a valid credit card to be provided at check in (just like at a hotel). If your pet has a special diet, please bring that diet and food with you when boarding, please note we do charge a small special feeding fee. Personal items such as beds, toys, treats are allowed, allowed provided they are new with retail hang tag attached. We cannot guarantee or be responsible for replacement, or that they will be returned in the same condition as when brought in. Medications- We only administer oral liquid & pill medication. Any pet requiring anything other than this should not make a reservation with us and will not be accepted into boarding. We do charge a fee to administer any medication. Please put the pet's name on any food or medication, place into plastic bag(s) with instructions for staff on each bag. We will return any unused items. We suggest that pets boarding 3 or more nights have a bathing service prior to checkout. Daycare- added on to daily regular boarding $15 per day, no additional charge for penthouse kenneling. Holiday Fees - See below information. If your pet has never boarded before we highly recommend some things that will help your pet adjust. Dogs are comforted by their daily routine. Changes in this routine, especially a big change like a boarding stay, can result in stress which in some cases can manifest an unknown stress-related illness. Needless to say we cannot predict this response. There are ways to make your dog more comfortable during a boarding stay and in turn reduce his stress level. A little preparation before a boarding visit can help ease your dog into the change, and will ensure that you have a happy and healthy pet waiting for your return. 1) Familiarize your dog with the boarding kennel several weeks prior to her stay. If the dog kennel has an open environment--one in which dogs play in groups during the day--bring your dog in for a day or two of play prior to its stay. If your dog will board for more than five days, plan a trial run of one night prior to the longer stay. 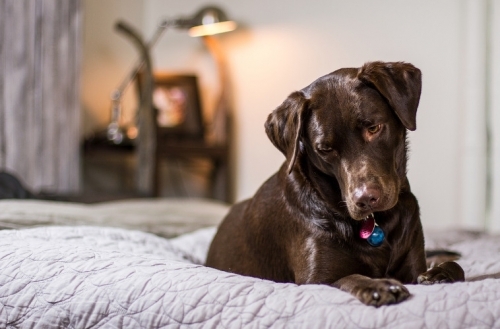 Familiarizing your dog with the environment and the people she will be spending time with will go a long way in reducing her fear and stress during her stay. 2) Prepare your dog's meals in advance and send them with him for the stay (or merely provide feeding instructions). Making sure your dog is fed his regular diet will help reduce the potential for stomach upset. If your dog has a history of stress-induced diarrhea, discuss this with your veterinarian prior to your dog’s visit. The vet may be able to make recommendations to reduce the risk of diarrhea. 3) We do not provide bedding for your pet. To maintain a sanitary and controlled environment, outside toys and bedding are permitted only if they are new with purchased tag attached. A disposable T-shirt with your scent is permitted to help reduce separation anxiety. Our facility is kept clean and disinfected beyond industry standards. We surface clean every day with a 99.9% disinfectant. We never stop cleaning! Please remember your pet is going to be around other animals and no matter how much we disinfect they still can pick up strange things off surfaces, other pets, or even airborne that can cause issues, or a trip to the vet clinic. We regret we cannot guarantee your pet will not contact strange things from other pets, and do not provide any compensation if they do. Due to the nature of our business and proper planning we request cancellations of all appointments or reservations as soon as possible prior to the day of service. Boarding Reservations must be cancelled at least five (5) days prior to arrival. Failure to cancel five (5) days prior to arrival will result in the forfeiture of deposit. Day Camp and Grooming Reservations require 24-hour cancellation notice. After 2 no show appointments or no notice of cancellation we will require payment in full before we can make your pets future appointments. Please remember we cannot check in any pet with out up to date vaccination records. Please have your clinic fax them to 404 636-4903. We recommend you follow up with us to make sure we have them, or bring a copy with you just in case. Our Lobby is Closed for arrivals/departures therefore a two-night minimum stay is required on: New Year's Day, Easter Day, Memorial Day, Independence Day, Labor Day, Thanksgiving Day and Christmas Day. A one nights deposit is required of non pack clients during holiday period rates. No additional charges for feeding our facilities food. Boarding Packs: Are sold in advance or at check in per pet, never at check out. They never expire and allow your pet priority status for upgraded kennels during their stay. A Pre Paid Boarding Pack Special is now going on! Boarding packs must be purchased prior to check in and may not be purchased at checkout. Packs are nonrefundable/exchangeable. Regular Boarding checkout is 2:00pm unless having services or using a pack, late checkout is one night's stay. Our lobby is closed for arrivals/departures therefore a two-night minimum stay is required on: New Year's Day, Easter Day, Memorial Day, Independence Day, Labor Day, Thanksgiving Day and Christmas Day. Holiday Rate of $7 per night is added to regular or penthouse non-pack prices for 1/1-2, 4/19-4/22, 5/24-28, 7/3-5, 8/30-9/3, 11/26-12/2, 12/20-31. Feeding your food $4 per day, medication $5 per day. We require a credit card at check in. Boarding checkout is 2:00pm unless having services or using a pack, late checkout is one nights stay. Prices/policies effective 4/1/19 and can change as needed.